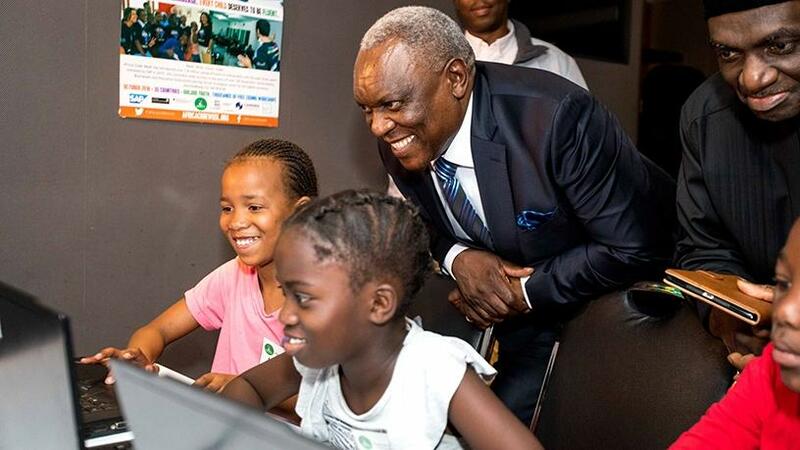 Minister Siyabonga Cwele engages school children at the SAP Africa Code Week launch in Johannesburg. SAP has embarked on an ambitious target to train 600 000 school pupils across 36 African countries in October, as part of the SAP Africa Code Week 2018 initiative. The fourth edition of the Africa Code Week was launched in Johannesburg on Friday. Established in 2015, the SAP Africa Code Week is an initiative that brings together hundreds of schools, teachers, governments, businesses and non-profit organisations with the aim to empower young people across Africa with digital literacy skills. The skills initiative was formed by SAP EMEA, in partnership with the Cape Town Science Centre, Google, Galway Education Centre, UNESCO and local government, among others. Since its launch, SAP says Africa Code Week has empowered and trained 1.8 million pupils with digital skills. This year, the initiative has been extended to the entire month of October, allowing schools and participating organisations one week of their choice to dedicate to training school pupils. Speaking at the launch, Cathy Smith, MD of SAP Africa, said the fourth industrial revolution is forcing a complete rethink of how education is approached, with a strong focus on lifelong skills development. "Africa Code Week is our response - by inspiring a new generation of African youth through digital skills development, and by empowering teachers and communities with digital teaching tools, we aim to accelerate digital literacy while ensuring a more inclusive and innovation-led workforce," she said. "As the African workforce swells by 112 million people over the next two years, initiatives such as Africa Code Week will be instrumental in ensuring that our youth can be active participants in the global digital economy." On a mission to empower 70 000 teachers and positively impact the lives of 2 million young Africans by 2020, Africa Code Week is supporting governments' sustainable capacity building strategies. Speaking at the launch, telecommunications and postal services minister Siyabonga Cwele said the fourth industrial revolution is reinventing the future of jobs, and digital skills are the fuel of the revolution. "The launch of the fourth edition of the SAP Africa Code Week is a timely intervention to ensure that children and youth on the African continent are armed with key 21st century skills to take full advantage of the fourth industrial revolution. Government is committed to investing everything required to produce a conducive environment for good quality teaching and learning to take place. "We commend SAP and its partners for delivering what is arguably the largest digital literacy programme on the African continent. Therefore, it is important for this initiative to go beyond raising awareness about the importance of teaching digital skills, but to also build capacity for sustainable impact and inclusion of coding in the school curriculum. We have to demystify the misconception that coding is only for mathematicians, scientists and doctors, and contribute positively within the context as government and private organisations." Placing a sharp focus on gender equality in developing countries, Africa Code Week has joined forces with the German Federal Ministry for Economic Cooperation and Development and UNESCO YouthMobile to ensure 50% of participants are female, through the G20 #eSkills4girls initiative. "For Africa to take its rightful place as a key player in the global economy, we must collectively drive digital skills development while placing a strong emphasis on encouraging female participation in an effort to bridge the gender gap," Smith continued. Over the next 25 years, Africa's working-age population will double to one billion, exceeding that of China and India. In the meantime, the digital skills gap in the continent is widening. SAP says coding has the power to put millions of young Africans on the path to successful careers and empower them to build sustainable growth where companies are currently struggling to hire qualified IT talent. World Bank data shows 40 million young people in sub-Saharan Africa are currently unemployed, with nearly 35% lacking the basic skills they need to perform a job, with technology skills an area of concern. Every year between June and September, SAP funds a series of Train-the-Trainer (TTT) sessions, to empower teachers with skills and teaching materials in order to drive the advance of digital skills in the school curriculum. "We acknowledge the critical role teachers are playing in preparing our children for a new tomorrow, which requires digital skills in order to thrive in the digital economy," said Cwele. "The TTT component of this initiative is extremely important, because if coding is not introduced to them, it is highly unlikely that our children and schools will know what coding is all about. "To date, this initiative has introduced 1.8 million young Africans to digital skills, an achievement that speaks volumes about the far-reaching impact of the public/private partnership in an ever connected world," he concluded.